Natural Latex comes from the Latex vessels under the bark of the ‘Hevea Brasiliensis’ rubber tree. This natural milk protects rubber trees against infection, fungus and bacteria. When Latex is processed it still maintains these amazing qualities. Being natural, hypoallergenic and dust mite resistant, 100% Natural Latex mattresses are perfect for asthmatics, children and anyone looking for a healthier better sleeping environment. Renowned for its natural qualities, latex contains a natural elasticity that allows it to bounce back to its original shape every time. The ‘push back’ feel that you get from a natural latex mattress provides soothing cushioned support while enhancing correct spinal alignment. Our mattresses are carefully selected for optimal support of back, hip and shoulders, whilst cushioning painful joints and muscles. With ‘cool vent’ technology and no pockets of springs to let you down, these 100% natural latex mattresses are for everyone looking for more support and less painful pressure on the back, hips and shoulders. Take advantage of our everyday low prices and update to a 100% Natural Latex Mattress – We ship Australia wide. 100% natural latex is grown as a renewable resource. Petrochemicals & synthetic latex are not used at any stage of the production process. No Perfumes/fragrances/masking agents or pigments used in the production process. Our standard latex mattresses are internationally certified 20cm latex mattresses which comprise of a 15cm block bonded to a 5cm block of the same density latex throughout. A 15cm mould is the largest mould size that can be used in the latex manufacturing process to ensure the consistency of density throughout the mattress and is considered standard in the latex bedding industry. The full thickness latex construction enables the mattress to be flipped over as well as rotated giving you the opportunity to balance out and spread the wear of the mattress for ensured mattress longevity. Available in all beds sizes from Single to King size, we can also shape our mattresses to size to fit caravans, boats and odd bed sizes. In Queen and King size we can provide you with different densities on either side of the bed. This option allows for personalized comfort and individual support levels and no partner disturbance. 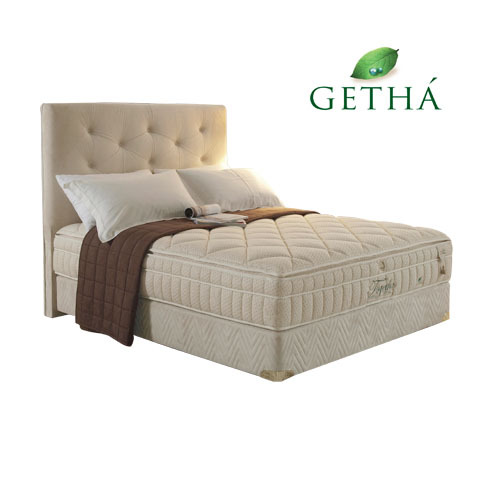 For that added layer of luxury choose from the range of luxury latex mattresses from GETHÁ of Malaysia. Opulently designed to the highest standard, these mattresses are for the discerning sleeper looking for the ultimate healthy natural sleeping environment. Although new to Australia, GETHÁ is a world leading natural latex bedding manufacturer. The brand is well known and highly regarded throughout North America, Europe and Asia for their superior quality and craftsmanship. GETHÁ have been a pioneer in the Latex bedding manufacturing sector for decades producing a range of mattresses and mattress toppers that exceed expectations of quality and design, leading to multiple international awards. Every bed is made with pride as can be seen in every stitch, handmade by a skilled team member of the passionate GETHÁ family. Click to Shop Natural Latex Mattresses Now!